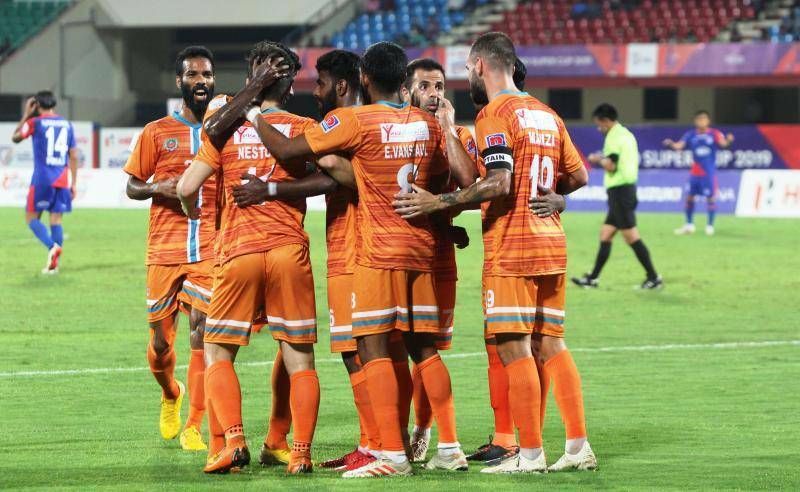 Chennai City FC came out on top in the battle of the champions, edging out Bengaluru FC 2-1 in the first quarter-final of the Hero Super Cup 2019 played at the Kalinga Stadium in Bhubaneswar on Thursday. Bengaluru went into the match as the reigning champions, having won the inaugural edition of the tournament last year, but the defeat marked a premature end to their title defence. Hero I-League 2018-19 champions Chennai City, meanwhile, progress to the semi-finals and will back themselves to clinch the double this season. Chennai goalkeeper Mauro Boerchio made a brilliant save to deny Sunil Chhetri from the penalty spot on the 52nd minute. Pedro Manzi scored a stunner on the 55th minute to double Chennai City’s advantage. Bengaluru started the match on the front foot, keeping possession of the ball and asking questions of the Chennai City FC defence, particularly down the right-hand side. Udanta Singh and Xisco Hernandez’s combination down the right flank looked dangerous early on, keeping the Hero I-League side on their toes. The first real chance of the match, however, fell Chennai’s way. Edwin Vanspaul’s pass from deep dropped kindly for Sandro inside the Bengaluru box and the Spaniard got his shot off. The effort sailed wide much to the relief of Bengaluru defence. The sudden scare was a warning bell for the Hero ISL champions and the next time it tolled, it sounded a much more dire consequence for the Blues. Just two minutes later, another accurate long ball, this time by Tarif Akhand, eluded two Bengaluru defenders and Nestor made sure he took the ball in his stride. The Spanish midfielder found himself one vs one against Gurpreet Singh Sandhu and calmly slotted past the India international to draw first blood. Going a goal down drew a sharp reaction from Bengaluru, who increased the tempo in search of the equaliser. Xisco had a brilliant chance to pull the Blues back on level terms on the 20th minute. He controlled Miku’s pass on the up, skipped past a couple of Chennai City defenders and had only the goalkeeper to beat. Unfortunately, all the good build-up came to nothing as he skied his effort. Five minutes later, Miku tried his luck from distance and it took a brilliant acrobatic save from Chennai goalkeeper Mauro Boerchio to deny the Venezuelan. Bengaluru continued turning the screws with some lovely build-up play in the midfield but the Chennai City backline kept their shape and afforded the Blues very little space inside the box, denying them any clear sight at goal. Chennai, on the other hand, made rare forays forward but broke with pace and intent whenever they did. Minutes before the half-time whistle, Chennai almost doubled their lead. A brilliant bit of give and go between Pedro Manzi and Nestor almost opened up the goal for the former. But Nestor’s final pass was just a tad undercooked, allowing Juanan to make a last-ditch interception to clear the danger. A fantastic half of football ended with the Hero I-League champions leading the Hero ISL champions by a solitary goal. Barely seven minutes into the second half, Bengaluru were awarded a penalty after substitute Alexander Romario Jesuraj brought down Sunil Chhetri inside the box. The Bengaluru captain himself took up the responsibility but Chennai City custodian Mauro stood tall and pulled off a magnificent save to deny Chhetri. The contest, however, was far from over. On the 65th minute, the Bengaluru no. 11 made amends for his fluffed penalty when he ghosted into the box to head home a Dimas Delgado corner. With 25 minutes to go, the score read 2-1. The Blues could have restored parity shortly after, when Chhetri found Dimas’ head with a cheeky lobbed pass. The Spaniard’s effort was on target, but Mauro was ready with another stunning save to bail Chennai out again. Bengaluru dominated possession and kept probing at the Chennai defence, which in turn put on a disciplined shift to deny the Blues continuously. With time running out, Chhetri almost found the much-sought-after equaliser. Rahul Bheke found Chhetri with a lovely cut back from the right and the striker did brilliantly well to flick the ball goalwards. The ball seemed destined towards the bottom corner but Mauro’s outstretched arm diverted it wide in the very last moment. The match eventually ended 2-1 in Chennai’s favour. At the post-match conference, Akbar Nawas, head coach of Chennai City, cut a delighted figure. He began the conference by praising his goalkeeper Boerchio for a stunning performance. “He has been performing very well for our last couple of games. He has been coming into the picture very well. As you know he just joined us recently. Football is such a wonderful game, a team game. We always talk about Manzi, Sandro and Nestor. Everyone makes the team. Everyone played their part, so I am very happy for Mauro for the part that he played today,” he said proudly. From Bengaluru’s end, head coach Carles Cuadrat shared his thoughts on the match. The Spaniard lauded Chennai City for a splendid performance but rued his side’s missed chances. “First of all, congratulations to Chennai City. We tried a lot of times. We had a lot of close situations where normally our strikers convert, but not today. We only scored from a set-piece, but we created enough chances to be the winning team. My players made some mistakes that led them to score twice. But they beat us and we have to congratulate them,” he stated. Chennai City FC’s Italian goalkeeper was absolutely sensational on the night. He didn’t only keep out Chhetri from the penalty spot, but also pulled off a host of brilliant saves to bail his team out on multiple occasions. His performance between the sticks earned him the Hero of the Match award.